A small stand of Coralberry (Symphoricarpos orbiculatus) has been growing at the edge of my creek since we’ve lived here. This small, tardily deciduous shrub remains invisible in the landscape most of the year, but finally gets noticed during the winter months. Its pinkish-red berries become impossible to ignore among the drearier browns and grays of surrounding winter vegetation. Among the sources I consulted, opinions vary regarding the tastiness of the fruit. Some sources insist that a number of native bird species eat it. Others point to the persistence of the berries in the winter landscape as proof that they are not favored food. Certainly in my landscape, every little 2-3-foot shrub I see usually sports clusters of bright pink berries well into the new year. My sources also note that deer browse this shrub lightly. One source notes that the leaves and berries are toxic to humans, which may explain the reluctance of deer to do more than nibble it. Given the 20+ year persistence of the cluster along my creek, where deer tracks denote a major highway for the hoofed ones, I’m guessing these shrubs are not very tasty. Coralberry is stoloniferous, which means it spreads via underground roots that pop up new plants near the mother plant. Consequently, it’s not unusual to find little thickets of Coralberry in the native landscape, where they create excellent cover and nesting sites for wildlife. 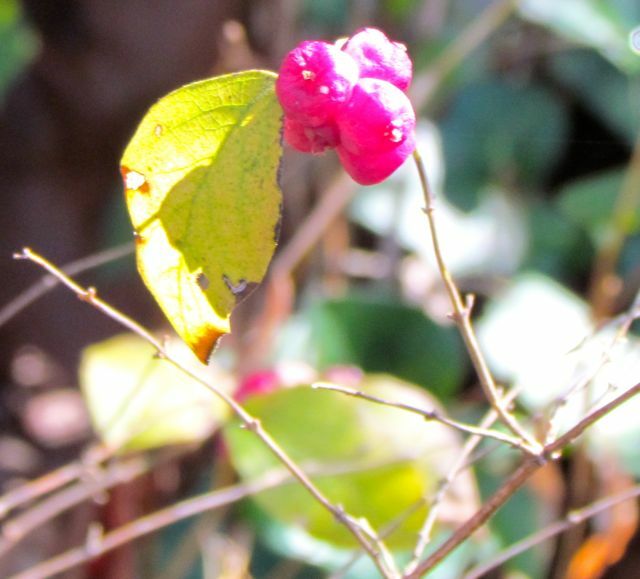 Over the absurdly mild holiday weekend, Wonder Spouse and I were raking yet more leaves and clearing out overgrown areas in our backyard when we stumbled on a thicket of Coralberry growing beneath the shade of a large Black Oak. We also stumbled across two cranky garter snakes, a disoriented worm snake, and a sluggish Carolina Anole — all reptiles that we normally expect to be in deep winter sleep by late December. Because I first found Coralberry growing adjacent to our creek, I had assumed that a moist floodplain was its preferred habitat. However, a quick search corrected my assumption. This shrub — a member of the honeysuckle family and a cousin to Snowberry (a northern cousin) — occurs naturally in about two-thirds of the continental United States, and adapts to a wide range of growing conditions, including dry oak-dominated hilltops. Thus, the stand we discovered beneath our Black Oak was right where it likes to be. According to one of my sources, this shrub is increasing its spread in nearby Virginia, behaving aggressively in dry woods, especially those underlain by diabase. Our property is underlain by several diabase dikes — igneous intrusions from activity in my region’s geologic past. In fact, the area where we found our Christmas Coralberry patch is dominated by giant diabase boulders that protrude above the ground. As we continue to tidy up this area, we’ll be keeping an eye on our new patch of Coralberry to ensure that it doesn’t overtake too much real estate in what is apparently its ideal habitat. We’ll also keep an eye out for reptiles until this crazy weather cools down enough to induce them to snooze for a few months. It’s a good thing to find a native plant in a new spot; it’s not such a good thing to encounter reptiles in unexpected places. Here’s hoping winter’s cold arrives soon and settles in to stay for at least a month! This entry was posted on December 28, 2011, 12:08 pm and is filed under Favorite Plants, Native Wildlife, piedmont gardening. You can follow any responses to this entry through RSS 2.0. You can leave a response, or trackback from your own site.